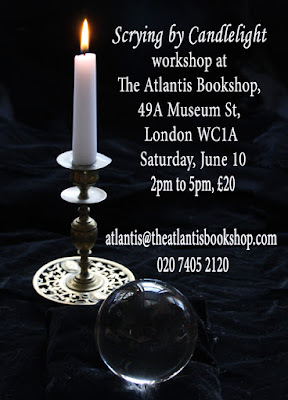 There are still a few places left on my afternoon workshop Scrying by Candlelight in the lovely basement temple at The Atlantis Bookshop in London on Saturday, 10 June. The workshop will teach the techniques of scrying using crystal balls, dark mirrors, candles and water. It is a practical afternoon with lots of opportunity to develop your psychic senses to see the past, the future and the answers to questions in reflective surfaces, flames and smoke. All materials are included. The workshop runs from 2pm to 5pm, with a break for refreshments. The cost is £20 per person. To reserve a place, email atlantis@theatlantisbookshop.com, call 020 7405 2120 or pop in to the shop at 49A Museum St, London WC1A 1LY.